There are some warning signs you should keep an eye out for that will alert you to the fact that your guttering may need to be repaired, cleaned or replaced. If any of these signs are present, it’s time to call in your roof repairs team. Guttering is an essential part of your home; it’s there to direct the water away from The interior of your home and protect it.They prevent water from making its way inside your home. Gutters and downpipes should be kept clear at all times, and this may mean getting the cleaned out a few times a year to ensure the longevity of your guttering system. Remember that most guttering will need to be repaired or replaced at some point to help protect your home. While small cracks or splits don’t seem like a big issue, even small cracks will one day turn into big breaks – which may happen sooner than you think. If you allow cracks to remain it can not only cause further damage to your guttering; it can damage the fascia boards behind the gutters. 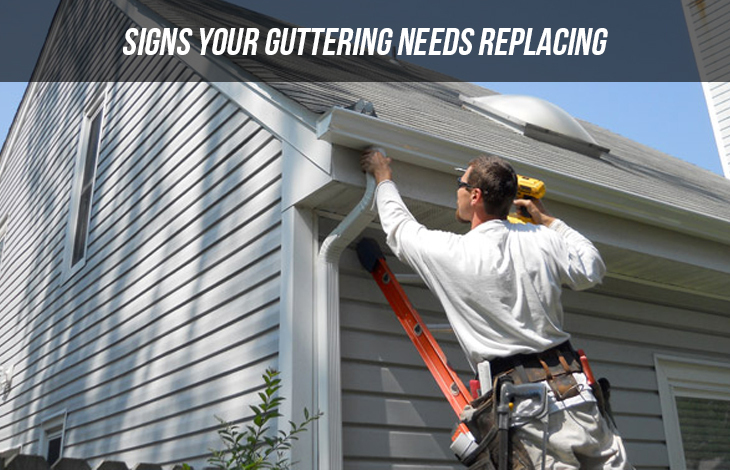 Gutters are designed to keep water flowing AWAY from the foundation of your home. If you notice mildew or pools of water around your foundation it can be an indicator that your gutters aren’t functioning as they should be. This could be something simple – a blockage – or something more. You certainly don’t need to be up on a ladder to notice this type of damage. Gutters should never sag or pull away from the house. This could indicate the gutters are blocked and full of water and are pulling away from the house due to the weight or simply have been incorrectly connected up originally.